"Hola, I'm Katia! I've been a tourism professional since the age of 16. From my first job at a remote hotel in Tortuguero, to managing the front desk, to guiding horseback trips in the jungle — I couldn't imagine a career where I wasn't meeting new people and sharing the beauty and magic of Costa Rica with them. I've traveled throughout my country extensively, and have had the pleasure of helping people get married in Costa Rica, celebrate graduations and anniversaries, recover from cancer treatments, and check items off of their bucket list. I also have a teenage son, so I know what it means to plan adventures the entire family can enjoy. 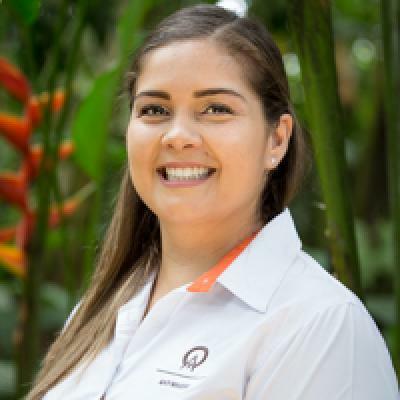 Costa Rica gives each visitor the chance to fulfill a dream—let this proud Costa Rican help you make yours come true!" We appreciate all the work you put into the trip for us and making adjustments as we requested. It was a wonderful trip - it exceeded our expectations. Katia and the rest of the team truly are professionals. Every aspect of our trip was well coordinated and fun. I will always try to use Anywhere.com when I travel. Katia was hands down amazing and so knowledgeable about the areas. Everything was spot on and we had no issues due to your amazing patience with all of my questions. Thank you for an incredible trip!! Thank you Katia for your knowledge and attention and always answering my questions over and again. Your recommendations were spot on for my daughter and I to have fantastic and memorable days in Costa Rica! Great responsiveness and easy to work with. The itinerary was perfect for us! Katia is the best!!! She has helped me with issues and last minute vacation ideas without any issue or problem! I have planned many vacations with her and they have all exceeded my expectations. There is never a hassle or undo stress when working with Katia. She is prompt and helpful and goes out of her way to handle any issues you may have during your trip. She is part of the reason we enjoy going to Costa Rica! You were amazing! Thank you for all you did and for organizing the best trip! We loved everything and can’t wait to come back to your beautiful country! You were fabulous - thanks for a great vacation Katia! We really enjoyed our time in Costa Rica. It was just the right amount of activity, culture & relaxation for us, all of the accommodations & travel to and from activities and the airport were excellent & timely. We found all of our guides and the staff at the resorts to be very warm, friendly, accommodating & knowledgeable. The guides were especially great & we loved all trips/experiences we had. The cooking class was a great way to experience culture & locals and that was a very special evening. One of our greatest memories of the trip is the sloth that we saw up close as it was crossing the road. We found Anywhere travel to be thorough & responsive and we didn't have any problems whatsoever. Thank you for making our trip to Costa Rica fun, safe & filled with good memories. This is the second time I have traveled to Costa Rica and utilized Anywhere. Excellent service. Thank you for everything and especially making that last minute change when our daughter tripped and fell and couldn’t do the rafting trip. You are fabulous! Katia, you were amazing! So helpful, prompt and totally accommodating! I have recommended your company repeatedly to all who have asked about our trip. Costa Rica was magical!!! You were awesome Katia! Thanks again for everything! !